Influence products and service decisions by sharing your opinion. Register with ProductReportCard to start earning. Complete our registration and you will begin receiving paid survey invitations via email within 24 hours. It takes less than 5 minutes to sign-up and is 100% free. Get paid for each online survey you complete. The more online surveys you take, the more money you will make. Earn cash, Amazon gift codes, or free products for each online survey you complete. I love productreportcard.com because there are so many different ways to participate. Surveys, product tests, product registration ,live chat, focus groups, discussion boards, etc... Thank you! I have been paid 100.00 for less than a hour call by researchers on my Rheumatoid Arthritis. I can help people get better treatments and get paid. Its very satisfying. I love being an influencer. I would recommend productreportcard.com and I trust them. I’ve made almost $250 on here! The surveys are fun and the payout is quick! ProductReportCard is one of the best survey panels today. They have so many opportunities to share your opinion. More than just surveys, interesting interview opportunities, in person or call conference. Much more ways to make some extra money. You can put in what you want. You will get handsomely paid for your time and opinions.Product Report Card is one of my favorite panels. It definitely will be worth your time to check it out. I enjoy testing the products that I qualify for. I also enjoy taking the surveys when available. I feel that the product testing pays fairly and it's fun to give my thoughts on how a product performs. It's important to me to give honest opinions to help companies develop the best product they can for consumers. Surveys are interesting and fun and you get compensation for each one tried. We used the cash out option and got our check really fast. Customer service is always quick to respond and helpful. Receive cash via popular gift cards. 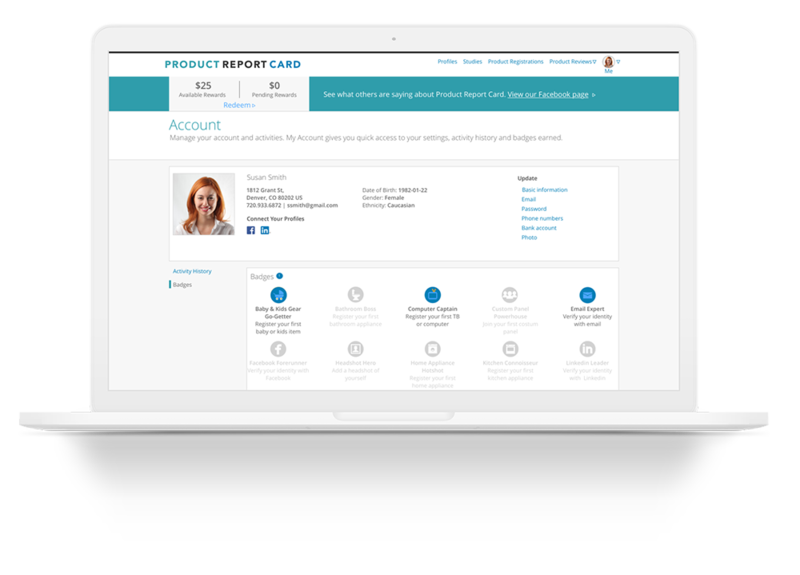 ProductReportCard connects consumers and subject-matter experts, like you, with our clients to share their insights into current marketplace trends.